You have whisky stones, made of soap stones. You have massive ice cubes and ice balls. It’s essentially ice frozen into a wedge shape on the side of a glass. Personally, I still enjoy my whisky neat. For those times I want to add a little water, I prefer to do it by the drop, rather than by the cube. That said, the logic behind the whiskey wedge is the same as the massive ice cubes and balls. The larger the mass of ice, the slower it melts. I’m not sure I buy it since the greater surface area means there’s more in contact with the whisky, so there’s more dilution involved. 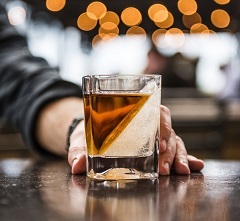 That said, the wedge shape maximizes size while minimizing surface area in contact with the whisky, so you mitigate the surface area issues somewhat. How’s it work? About as easy as you’d expect. When you buy the wedge “kit” from Corkcicle, it comes with an old fashioned tumbler and a silicone mold. You fill it with water, stick in the mold to make the wedge, and then freeze. Presumably the silicone expands as the ice freezes, and you create this wedge. I don’t have one nor do I see myself getting one (I have whisky stones and I use those more for chilling my wife’s wine than anything else! ), so I have no first hand experience. What do you think of it? Gimmick or something you’d actually use? This entry was posted in Barware by Jim. Bookmark the permalink. Couldn’t you just put your own tumbler in the freezer on an angle ang make your own wedge? I don’t ice whisky so i don’t get it. Ha true, then again, I’m like you so I never really thought about what I’d have to do to make a wedge! This just seems like another gimmic that some one came up with to make a few bucks and nothing else, and I am sure there are people out there that are buying them so I can’t say that I blame the individual that came up with the idea. ice in single malt?! should be a crime!! As I said to Jim by e-mail (while smacking my forehead with my palm), this is a perfect solution to a problem that doesn’t exist! Gimmick all the way. I do put ice in my drink on occasion and use the mini cubes, about 3/8 inch in all dimensions. So I can control the amount of ice, they melt quickly and give me the amount of water I would like. My mom (not a whiskey drinker) got me one for Christmas because she thought it looked cool. The thought was appreciated (gotta love mom’s 🙂 ) but, as already said by most, I usually don’t ice any scotch. The wedge is pretty neato for a small sized, killer white russian and also nice for something sweet like Amaretto. That being said, a few easy drinking very light Irish single malts go well on ice sometimes and this does work nicely and makes a nice presentation. I still prefer spheres. You’re right about the Irish’s, I haven’t had many but the ones I’ve had I’ve enjoyed (Teeling Single Grain being the most recent one), I’ll keep an eye out of Tyrconnell. I appreciate the delicateness of the ones I’ve tried and I can see how the category works well on a hot summer night with BBQ – I’ll have to give it a shot!